As a decorative art specialist, I have been taking my first tentative steps into fine art since being appointed as curator at Temple Newsam House two years ago. Earlier this year, I was very excited to acquire a John Russell (1745-1806) portrait of Savile Green, Senior (1743-1805; Fig. 1).¹ Green was a key figure in the Leeds Pottery, a major producer best known for its fashionable and elegant creamware (Fig. 2). Temple Newsam holds the best public collection of ceramics by the Leeds Pottery, as well as excavated material from the factory site, a unique collection of its moulds and blocks for making ceramics, and some documentary material. This new acquisition captures one of the firm’s key players and its inclusion in the collection allows us to better tell the story of this important part of Leeds’s industrial heritage. What is perhaps even more exciting, is that it also includes a remarkably rare view of the factory itself, at the height of its success and influence. John Russell first visited Leeds in 1793 and secondly in 1803. He was commissioned to create portraits of a variety of notable individuals from the city and surrounding region, including three figures associated with the Leeds Pottery. The first is an oil of Alexander Turner, also held at Temple Newsam House (Fig. 3). 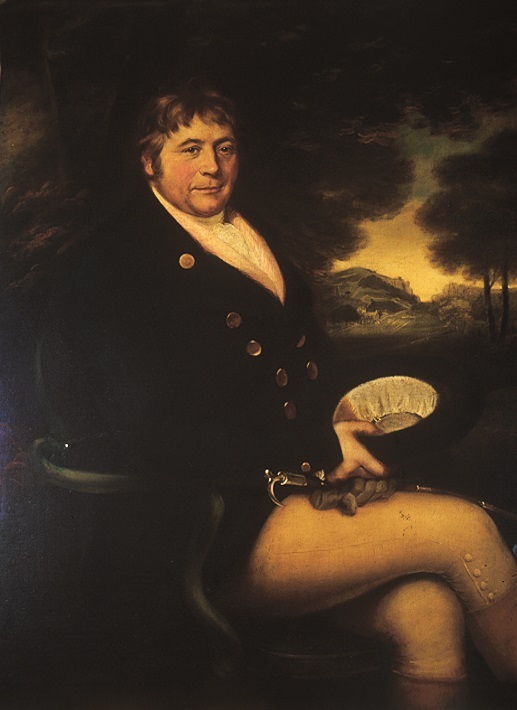 Turner was Mayor of Leeds in 1793 and again in 1810. After the personal bankruptcy of one of the Leeds Pottery shareholders, Turner held the shares of all other Leeds Pottery partners in trust until his death in 1816. The only trained potter among the company’s shareholders, John Green, also commissioned a portrait from Russell. Unfortunately, the whereabouts of this portrait are unknown, but it depicts John Green in a smart interior sat at a desk and is reproduced here. Savile Green, Senior, was born to parents Catherine and John Green of Swinton and was baptized in Mexborough, South Yorkshire.² The Greens were a gentry family, who had settled in the region in the seventeenth century. Little is known of Savile Green’s early life, but his 1766 marriage certificate gives his profession as a ‘mercer and linen draper’. 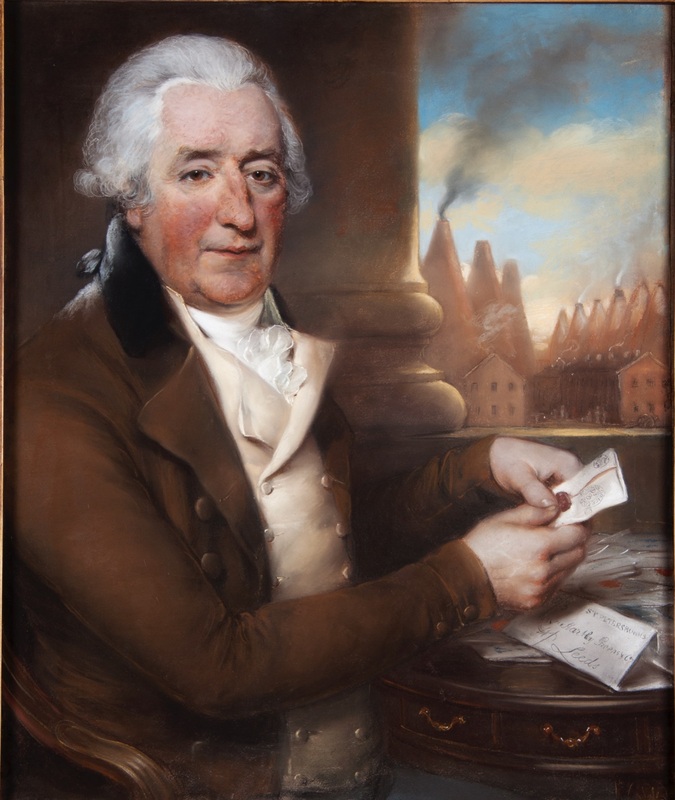 Green became a partner in the Leeds Pottery on 13 August 1777, when he purchased a 1/14 share from Richard Humble for £450. He had previously been book-keeper for the company and was a witness to the original indenture of 26 November 1770 that saw the Leeds Pottery founded. The portrait is a wonderful representation of industrial pride. Green sits at his desk, which is practically overflowing with piles of correspondence, suggesting prosperity. His window opens directly onto a view of the factory site below and it is very likely that the sitting for the portrait took place at Green’s home. A plan of the Leeds Pottery site indicates that the view from the window broadly corresponds to that from Green’s house, which was part of a small group of outlining dwellings, at the convergence of the two roads that encircled the factory, Waggon Road and Jack Lane. Workers and equipment can be seen in front of the buildings and smoke billows from the bottle kilns used to fire the ceramics – it is bristling with productive activity. Green holds a letter clearly addressed to Hartley Greens & Co (the trading name of the Leeds Pottery) from St Petersburg. The pottery had an agent and merchant in the city and letters that remain in the family tell of Savile Green, Junior (1787-1820) travelling on pottery business, including to Russia in 1806, as well as to Brazil, Rio de Janeiro and Madeira. 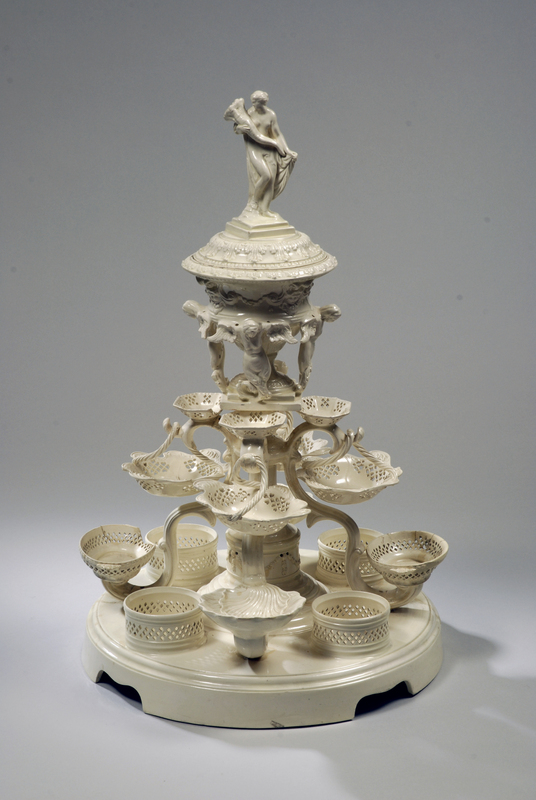 The inclusion of a contemporary depiction of the Leeds Pottery works is a remarkably rare occurrence and makes this portrait highly important within the history of British ceramic manufacture. The only other contemporary depictions of the pottery that I have seen are a stylized engraving on a bill head of 1827 (Fig. 4) and Alphonse Dousseau’s watercolour panorama of Hunslet, Leeds from Rope Hill circa 1840, which shows the factory at a distance within the broader industrial landscape (Leeds Museums & Galleries, Social History Collection, ref. LEEDM.E.1932.0301.0003). More familiar among ceramic historians are a series of later black and white photographs of the pottery, taken when it was largely in a state of dereliction – ‘standing dismantled’ – published by authors Kidson & Kidson in their book detailing the history of the company in 1893. A number of these can be seen on the Leodis website, including one taken just a couple of years after the closure of the works, showing the bottle kilns that are so prominent in Russell’s portrait. 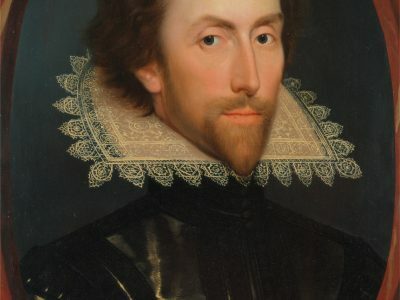 The portrait of Green now hangs alongside that of his colleague, Alexander Turner, in the State Dressing Room at Temple Newsam. Fittingly, they will both soon preside over a new display of Leeds Pottery that is being planned in the same room. I am thrilled that the portrait will be enjoyed by visitors to the house for years to come, especially as we draw ever closer to marking the 250th anniversary of the founding of the pottery. 1. 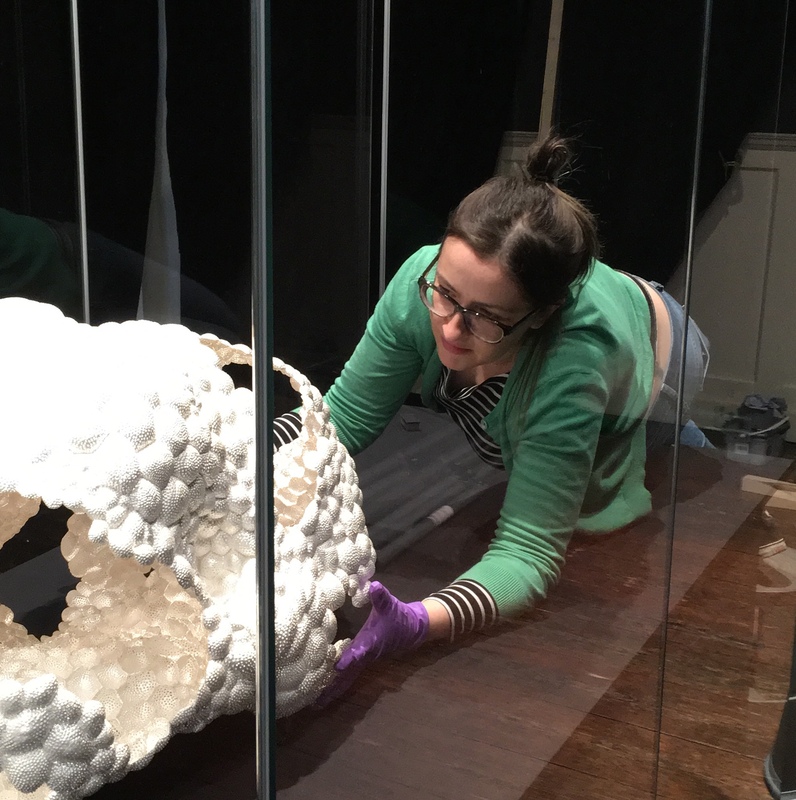 This acquisition was made possible with the generous support of the MLA/V&A Purchase Grant Fund, Leeds Art Fund, Friends of Leeds Museums and Mr Michael Goodacre. 2. I am fortunate to be able to draw on the work of John Griffin, researcher of the Leeds Pottery, for biographical information on the sitter (Griffin, 2005, The Leeds Pottery, 1770-1881. Leeds: Leeds Art Fund).